Is anyone a fan of the eighteenth century? 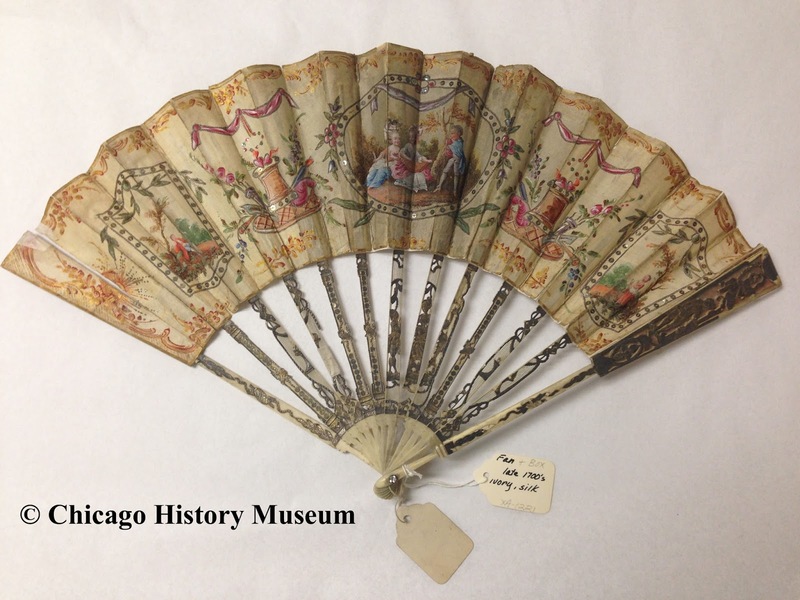 Fans have been an important luxury item, status symbol, and practical object throughout history. Fans survive from cultures all over the world, many showcasing incredible artistic virtuosity. 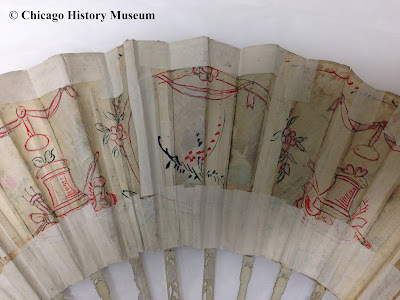 While working at the Chicago History Museum in 2014 I was lucky enough to study some of the fans in the collection. This post will highlight two of the eighteenth-century fans in their collection-- just a small sampling of the museum's treasures! "Women are armed with Fans as Men with Swordes, and sometimes do more Execution with them." A fan was one of the most coveted accessories in the eighteenth century. Often incredibly elaborate and extremely expensive, fans were not only a fashion statement but also a show of wealth and status. Fans have two main components: the leaf and the sticks. In the eighteenth century, the leaf could be made from silk, paper, lace, or a delicate type of vellum (skin taken from young animals). 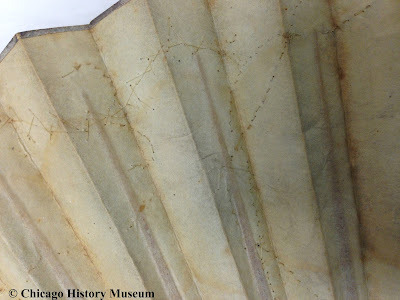 The sticks are the skeletal structure of the fan, and higher-quality fans had sticks made of luxurious materials such as ivory or mother-of-pearl. Some of the most expensive fans had sticks inlaid with gold, silver, and precious jewels. Painted silk fan, late eighteenth century. XA-1221. Chicago History Museum. Photo by Katy Werlin. This fan, attributed to the late eighteenth century, is extremely ornate. The leaf is painted silk decorated with metal spangles and silver-thread embroidery. The sticks are made from ivory overlaid with silver. 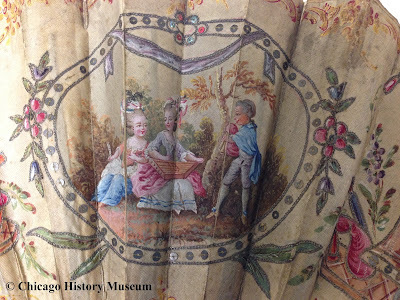 Detail of painted silk fan, late eighteenth century. XA-1221. Chicago History Museum. Photo by Katy Werlin. The central scene painted on the leaf shows well-dressed nobility leisurely playing a flute, a psaltery, and a musette (a type of bagpipe) in an idyllic natural setting. Flanking the central scene are pedestals surrounded by musical instruments and flowers. On top of each pedestal is a pair of flaming hearts, symbolizing love and desire. Perhaps this fan was a wedding gift or a present from a lover? Detail of the back of the fan, showing the outlines of the unfinished design. The white tape is from a previous conservation treatment from an unknown date. Painted silk fan, late eighteenth century. XA-1221. Chicago History Museum. Photo by Katy Werlin. The back of this fan tells an equally intriguing story. Fans were often double-sided, featuring beautiful images on both the front and back. The back of this fan has a basic sketch of a design similar to that on the front, but it is left unfinished. 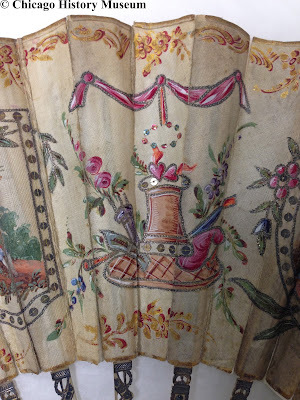 This provides excellent insight into the artistic process of fan artists in the eighteenth century-- the back of the fans hows the beginning of the design process while the front shows the finished product. It also raises a few questions: Why did the artist leave the back unfinished? Did he or she run out of time? Was the client unable or unwilling to pay for the extra work? Perhaps the love affair ended halfway through the production of the fan, and the client did not wish for it to be finished? Printed fan, c. 1790s. Gift of the estate of Anna P. Williams. 2380-50H. Chicago History Museum. Photo by Katy Werlin. This printed fan is from the opposite end of the spectrum from the luxurious fan featured above. Due to the time it took to produce fans and the expense of the materials, fans in previous centuries had only been available to the upper classes and were highly valued luxury items. 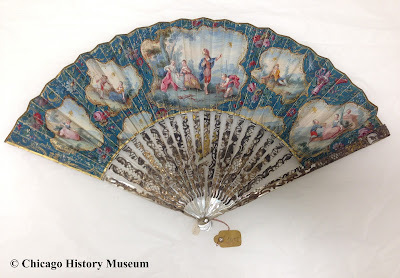 However, in the eighteenth century, fans became available to a much wider market and became an important accessory for all classes. 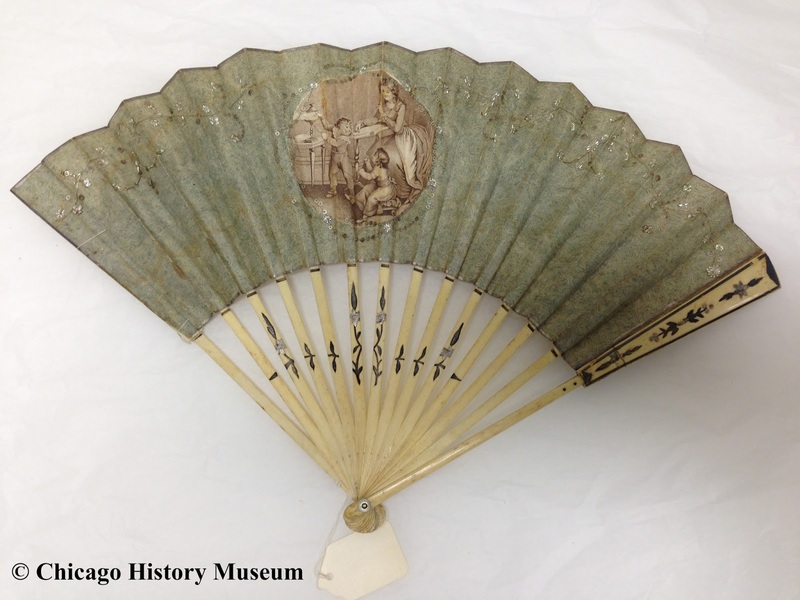 In the 1720s fan makers began printing fan leaves and mounting them on sticks of plain wood. These printed fans could be quickly produced en masse and sold cheaply. Due to the ease and speed of the printing process, printed fans could be made to commemorate important events and serve as souvenirs for travelers. Detail of printed fan, showing the off-center placing of the central image. Pinted fan, c. 1790s. Gift of the estate of Anna P. Williams. 2380-50H. Chicago History Museum. Photo by Katy Werlin. This printed fan is much less meticulously crafted than the painted fan above. The main image, of a mother an her two children, is off-center and does not quite fit into the circular blank space left in the background. The sticks are made of wood and painted with a simple design. Silver spangles decorate the leaf. Back detail of the fan, showing the stitches holding the spangles in place. Printed fan, c. 1790s. Gift of the estate of Anna P. Williams. 2380-50H. Chicago History Museum. Photo by Katy Werlin. 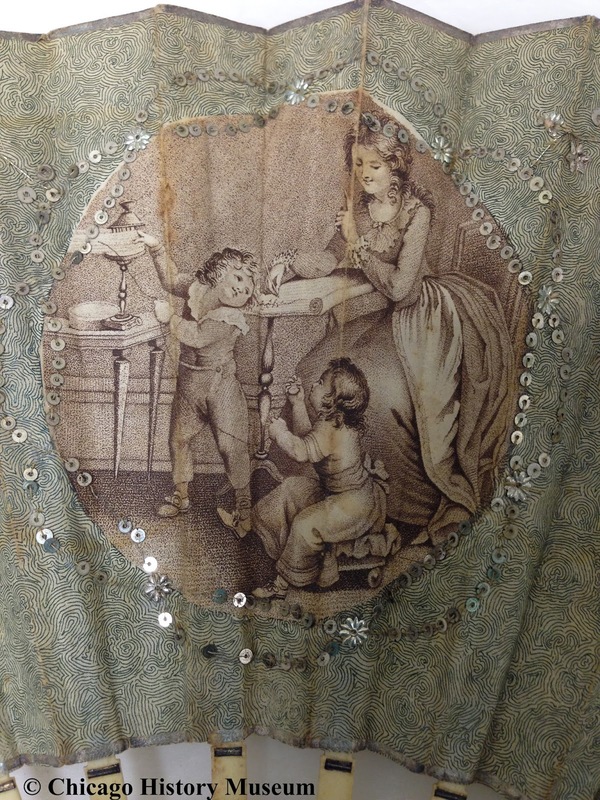 As can be seen in this image of the back of the fan, the spangles are sewn through the paper, leavig the stitches visible on the back. Perhaps the owner of this fan added the spangles herself to bring a little sparkle and personality to her mass-produced accessory. Or maybe a merchant bought several printed fans, customized them with spangles, and resold them. We will probably never know the full story of these fans. Why was one left unfinished? Who added the spangles on the other? But it is in these intriguing details and questions that we find a connection to the people of the past, allowing us the briefest glimpse into their lives and stories. "Unlocking the personal and cultural narratives hidden in the folds of a garment is a little bit like being Sherlock Holmes. 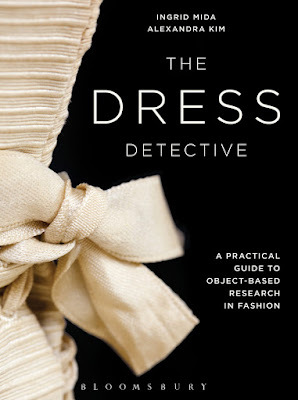 A dress detective looks for and interprets the clues..."
I love this quote which begins the Introduction to The Dress Detective, a new book focusing on the methodology of object-based fashion research. As a longtime fan of Sherlock Holmes I love that I get to don his mythical deerstalker myself and search for the small details that might reveal a person, a place, a time. Detective work is integral to fashion history research, yet very little has been written on how to go about it. Ingrid Mida and Alexandra Kim fill that gap in the bookshelf with The Dress Detective. This book provides an excellent guide that is sure to be extremely useful for students and professionals alike. The Dress Detective has two main sections. The first (chapters 1 through 5) details the steps one should take to read an object. The second (chapters 6 through 12) puts this theory into practice, providing case studies of a wide assortment of different extant garments which utilize the methods laid out in previous chapters. There are also two extremely helpful appendices, providing a "Checklist for Observation" and a "Checklist for Reflection"; two blank forms the researcher can use to guide their study. Each chapter is accompanied by multiple color images to illustrate every step of the process, a must-have for a book like this. The organization of this book is fantastic, providing not only the theory of fashion research but multiple examples of how to actually do it. The case studies cover both men's and women's fashion from the early 19th century to the present, demonstrating how to approach researching a variety of garments. The "Checklist for Observation" and "Checklist for Reflection" are extremely detailed, pointing the researcher in directions they may not have considered. I particularly appreciated chapter 1, "A Brief History of Object-based Research with Dress Artifacts". 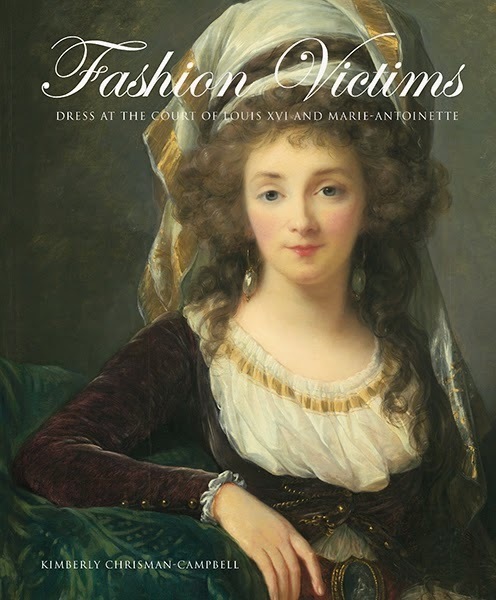 This chapter considers some of the pioneers of the field of fashion history such as Doris Langley Moore, Anne Buck, Janet Arnold, and Jules David Prown, as well as important historians working today such as Valerie Steele, Alexandra Palmer, and Lou Taylor. As a historian I, of course, appreciate the history of historians and was happy to see Mida and Kim acknowledge those who came before. On a practical level, this chapter also directs the curious reader to other sources of methodology and research (I highly recommend Jules David Prown's 1982 article, "Mind in Matter: An Introduction to Material Culture Theory and Method", which is briefly summarized in this chapter). There are many boring, jargon-filled texts about history methodology. The Dress Detective is not one of them. This is a concise, well organized, and extremely accessible book that deserves a place on the bookshelf of anyone interested in fashion research. Many thanks to Bloomsbury for the review copy of this book! We're finishing up Textile Month after some technical difficulties! This week we bring you the long awaited Part 2 of our Art Deco textiles series. 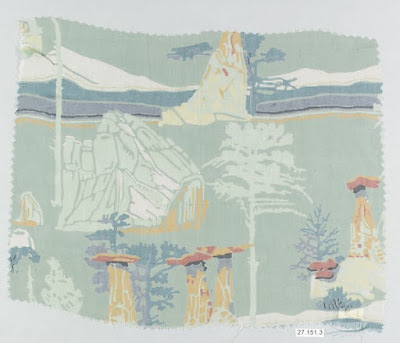 Catch up with Part 1 at the link below, and then read all about how American history and contemporary life influenced new textile design in the 1920s! Sample from the "American National Parks" series, H. R. Mallinson and Company, ca. 1927. The Metropolitan Museum of Art, 27.151.3. "It is France, the United States, and Britain whose naval uniforms and maritime clothing have had a lasting legacy around the globe. 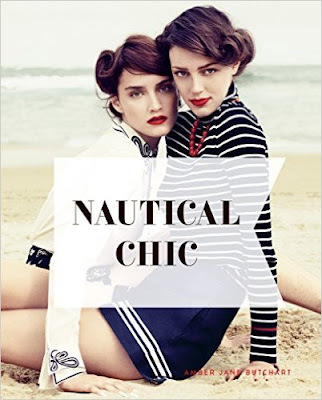 From tailoring to sportswear, and from haute couture to the high street, these countries are the key producers and exporters of nautical style. Intertwined with politics, imperialism, war, leisure, trade and sport, marine passions and seafaring endeavours have made the journey from lifeblood to lifestyle." 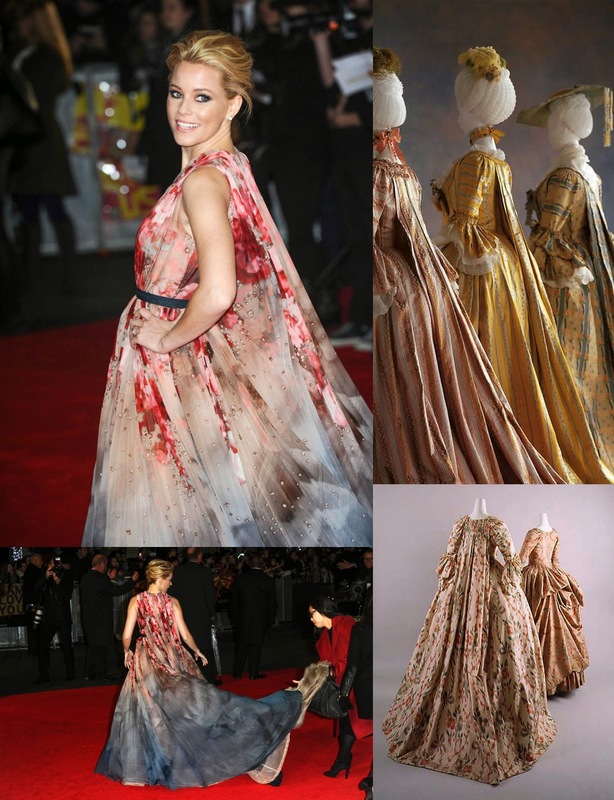 It's Textile Month here on The Fashion Historian! Each week this month we'll be bringing you a textile themed post. 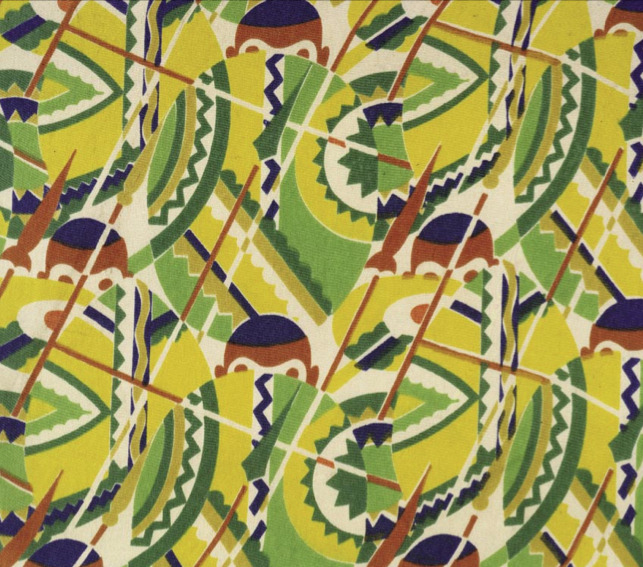 This week, in Part 1 of a two-part series, learn about how the art of non-Western cultures influenced the explosion of American textile design in the 1920s! Safari silk titled "Kando" or "Samburu" by Belding-Heminway Co., 1930. Newark Museum, New Jersey. This print depicts African warriors standing behind shields. It's Textile Month here on The Fashion Historian! Each week this month we'll be bringing you a textile themed post. 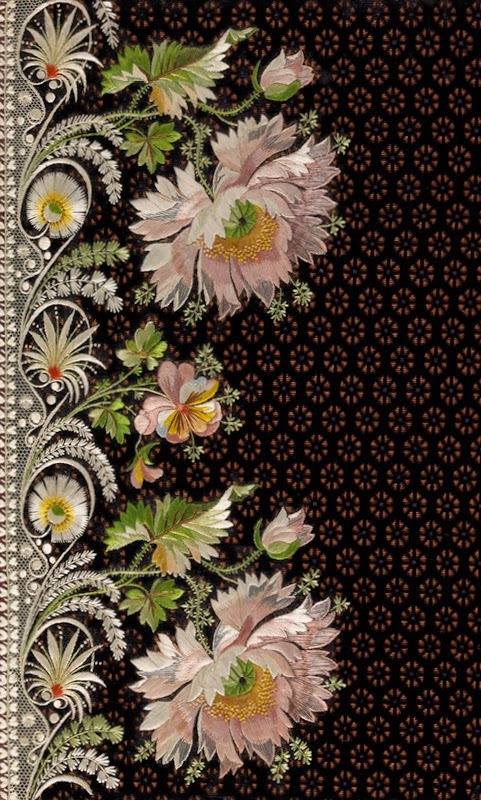 This week, learn about printed textiles in eighteenth-century America! Dr. Kimberly Chrisman-Campbell recently published her first book, Fashion Victims: Dress at the Court of Louis XVI and Marie Antoinette. After looking through this lavish text, I wanted to know a bit more about how this book came together. What is the story behind the story? Find out in my exclusive interview below! Myth: Fashionable eighteenth-century ladies shaved off their eyebrows and used false eyebrows made of mouse fur. 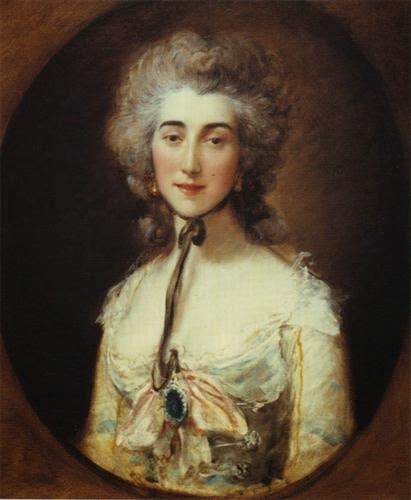 Grace Dalrymple Elliot by Thomas Gainsborough, c. 1778. Private Collection. Are those eyebrows made of mice? Any visitor to the Metropolitan Museum of Art in New York City should stop by Gallery 599 on their tour of the museum. It's a small gallery, to get there you simply descend a small flight of stairs tucked away in the back corner of one of the large medieval galleries. Gallery 599 is located by the door to the Ratti Textile Center, which houses all of the textiles in The Met's collections. A rotating exhibition showcasing small samplings of The Met's textiles is featured in the display cases surrounding the door to the Ratti Textile Center. It's a quick pitstop on your tour of the museum and always well worth a visit as you get to see some rarely viewed textile treasures. 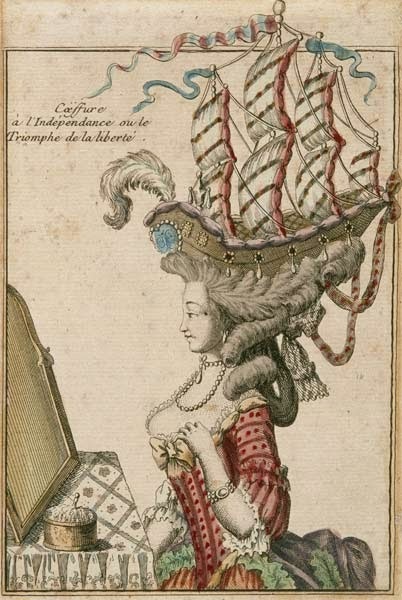 One of the most famous and persistent images of the eighteenth century is a woman with an enormous tall wig decorated with ribbons, feathers, and all manner of figurines. Known as the pouf, this tall hairstyle is often cited as a visual representation of the excess of the 18th century. But these tall hairstyles were not just an example of extreme elite fashion. Often times these hairstyles were an expression of patriotism, politics, and the latest trends in culture. Today we may express our personalities and taste by wearing a T-shirt bearing the image of our favorite band, sports team, or the flag of our country. In the late 18th century, aristocratic women did the same thing using their hair. 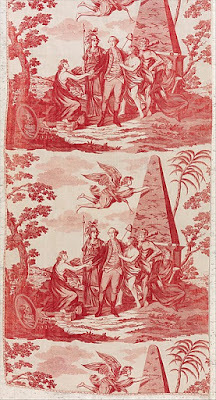 Anonymous, Coëffure à l’Indépendance ou le Triomphe de la liberté, c. 1778. In the collection of the Musée franco-américain du château de Blérancourt. 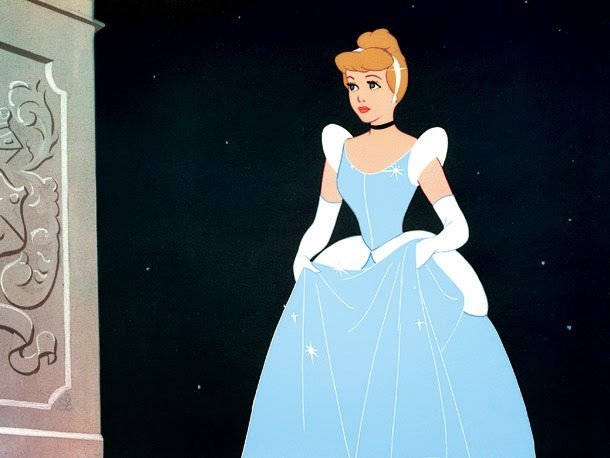 As a fashion historian, I find that an interesting aspect of Disney is how the animated features serve as records of the visual culture of their day. The Disney Princesses, a successful sub-franchise launched by Disney in the late 1990s, are everywhere these days. They have not been without controversy, but they are certainly popular. They are also records of changing standards of beauty for women in the 20th century. This post series will discuss selected Disney Princesses, exploring how they embody the ideals of femininity of their time. La mode à la girafe translates to giraffe fashion, that is, fashion inspired by and celebrating giraffes. Or, in the case of late 1820s France, the fashion influence of one very famous giraffe. 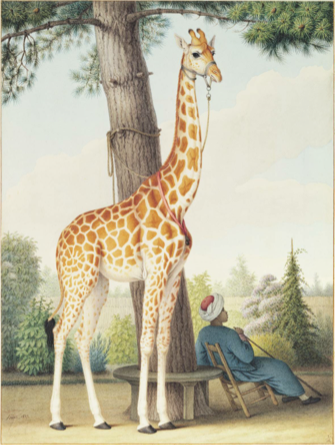 Nicolas Hüet, Study of the Giraffe Given to Charles X by the Viceroy of Egypt, 1827. In the collection of the Morgan Library and Museum. Fashion has always had a strong relationship with new technology. In the late eighteenth century, looms ran on punch cards to weave complex textile designs-- the very first computing technology. In the nineteenth century, the discovery of synthetic dyes allowed fabrics to take on bright, eye-popping colors. 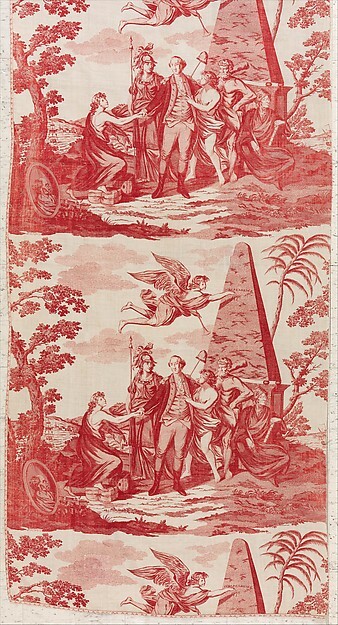 In the twentieth century, an enormous range of textiles made from synthetic materials, each with its own unique benefits, flushed the market. And in the twenty-first century, designers are using 3-D printers to create new and innovative designs. Fashion has also always had strong ties with the media. New trends need to be disseminated around the world somehow, be it by illustrations, photographs, or film. These days we can log on to youtube and watch the latest runway shows instantly, but the relationship between film and fashion stretches much farther back in time.